Car Rental at Newark Airport - Quality cars at Low prices! Van rentals, convertibles, luxury cars, SUVs and sports cars are some of the most popular & highly rented categories at the Newark Liberty International Airport. Rent a car for Newark Liberty International Airport in just three quick steps - search, compare, reserve! Cancel your Newark Liberty International Airport car rental for free, up to 48 hours before the pickup time. We are a rental company offering affordable Newark Liberty International Airport (EWR) car rental services. Quality service, on time delivery and competitive rates are just a few of the things we have on offer. With us, book your car online even before you head out for New Jersey and let us help you see New Jersey in a relaxed, comfortable way. Affiliated with popular Newark Liberty International Airport car suppliers, we offer wide range of pick up and drop off rental locations. We also offer number of cars with various inclusions like liability insurance, unlimited mileage, roadside or breakdown assistance and more. We offer 24/7 customer care service for queries and doubts regarding Newark Liberty International Airport car hire. Initially named Newark Airport, Newark Liberty International Airport is operated by the City of New Jersey and the Port Authority of New Jersey; although the City of Newark has full ownership of Newark Liberty International Airport. Located 15 miles southwest of Manhattan, New York City and is accessible from Exits 13A and 14, either by a taxi service or via Newark Liberty International Airport car rental. The Newark Liberty International Airport has about 35,000,000 people passing through its gates each year, on an average, making it the tenth busiest airport in the United States. It provides aviation services to both New Jersey as well as the city of New York and was the first big airport to have opened in the New York City area. Spanning a massive 2027 acres, Newark Liberty International Airport has one helipad and three runways, the longest measuring 11000 * 150 feet. Getting to the airport is not a hassle as there are numerous Newark Liberty International Airport car rental services, to get you there. Pets are not allowed unless they are properly carried in pet-specific carriers Smoking is prohibited in the airport zone with the exception of certain designated smoking zones within the airport bars. The facilities that Newark Liberty International Airport offers are, Currency Exchange, ATMs, popular restaurants and cafes like Starbucks and Subway. Internet access points are available throughout all terminals, as are helpdesks, assistance and emergency services. Internet services are available though it is a pay-as-you-go service. Postal services and Lost and Found are also available. Newark Liberty International Airport has a number of options when it comes to parking and you can choose which service best suits your needs. Jersey City(6mi) – Visit the famous museums like the Jersey City Museum, Museum of Russian Art, Afro-American Historical and Cultural Society Museum. New York(9mi) – Major crowd pleasers in New York include the Time Square, Statue of Liberty, Central Park, Coney Island, Bronx Zoo, parks and much more. 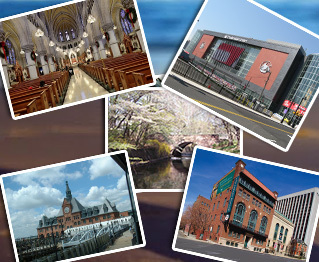 Newark(3mi) – The city is very popular for its cultural heritage and you can visit the Newark Museum and Museum of New Jersey. There are different festivals and events you can be a part of. Philadelphia(73mi) – The city is famous for its cuisines and cheesesteak. There are art museums and parks for sightseeing. Inspired by Gothic architecture, this Basilica is North America’s biggest. This center is an indoor arena that hosts many events around the year. 360 acres long, this park comprises of lakes and playgrounds. This historical society houses a vast collection of ancient art.